Dr. Christina Meiners is always on the go. The 2017 10 Under 10 winner works full-time at a community health clinic in San Antonio, but spends her evenings and weekends volunteering her time and talents in a multitude of ways. Growing up, service to others was a big part of Dr. Meiners’ life. Her family went to Mexico on frequent mission trips, providing people with food, clothing, medicine and toys. Dr. Meiners said that if she wanted something new, she would first have to donate something old. “I learned from a very early age that what I had to give could be a real blessing to others,” said Dr. Meiners. In college, she jumped at opportunities to do mission trips with her predental program. Seeing the impact these trips had on the people they served helped inspire her to choose a career in public health. After graduating from dental school, Dr. Meiners found that she had much more time on her hands. She wasted no time finding opportunities to give back. “I started volunteering most weekends. Whether the event required providing dental care, dental awareness or simply involved grabbing my tooth costume and passing out toothbrushes to those attending the event, I did whatever I could to have a positive impact on my community,” Dr. Meiners said. All that volunteer work eventually led to leadership opportunities. She had been volunteering at the San Antonio Christian Dental Clinic – a free, volunteer-run clinic – so often that she was asked to join the clinic’s board of directors. 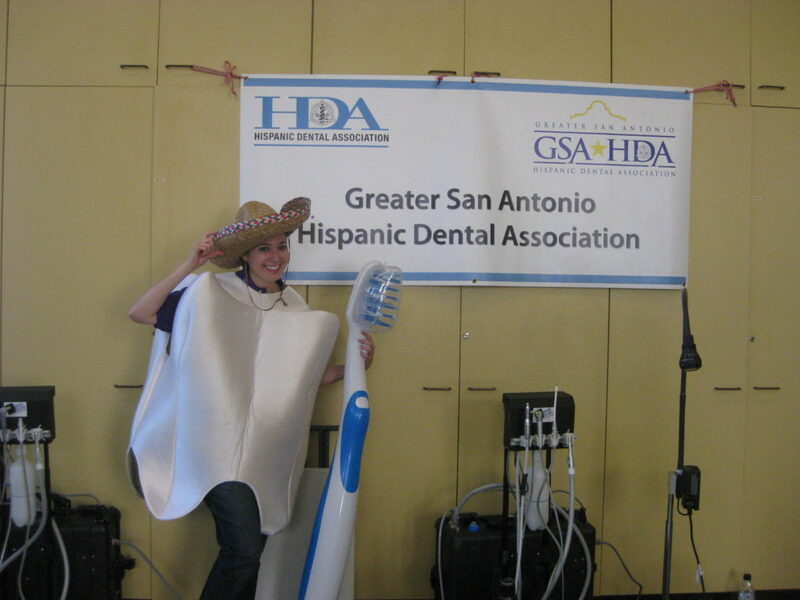 Dr. Meiners worked with her local Hispanic dental society – where she is a past president and serves on the national board for the Hispanic Dental Association (HDA) – to implement a clinic program to provide free dental care for veterans. She also serves as the vice president of her local dental society and chairs their annual “Smiles of Hope” clinic to provide dental care to homeless and low income adults in San Antonio. She is also passionate about helping to foster the future leaders of the dental profession. She helped create the Building Our Leaders in Dentistry (BOLD) program with the HDA, which introduces high school and college students to dentistry as a career option. The program offers resources, mentoring, shadowing and scholarship opportunities to these students, and is now a national program through the HDA to encourage more minority students to pursue dentistry. The HDA recently presented Dr. Meiners with its 2018 National Service Award for her efforts. People have asked how she became a leader in so many projects and organizations. She has a simple answer. “I said yes! I think I worked myself into these leadership positions by making myself more available and being open to new opportunities,” Dr. Meiners said. Dr. Meiners attributes much of her success to the networking and relationships she’s built through her involvement in dental organizations. Dr. Meiners is a winner of the 2017 10 Under 10 Award. Nominations for the 2018 10 Under 10 Awards opened Oct. 1. To submit a nomination, visit ADA.org/10Under10.